Engaging students with video multimedia is a great way to begin a class. Experts recognize that before learning can occur, a student must be engaged - that is, a student's attention must be focused to receive information for processing. Video multimedia with sound engages through separate input channels, and so commands attention by this activity. Careful selection of video from YouTube will command a student's attention, and will also serve additional pedagogic purposes. Scott scours over 100 YouTube channels for videos of potential interest for teaching science. His (near) daily posts may be found here. To supplement textbook topical coverage, and to demonstrate contemporary issues, we have found numerous YouTube videos that bridge textbook topics to current events with sufficiently high value for inclusion in our valuable and limited class time. 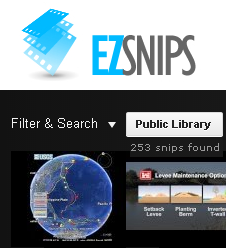 Check out our Gallery of Earth Science Videos, and head on over to the EZsnips public library.